The salad is healthy, easy to prepare and pairs well with grilled meats and fish. Use a shredder to shred cabbage or slice thinly with a knife. Soak in water, rinse and dry. In a jar or small bowl mix the olive oil, lemon juice and minced garlic. 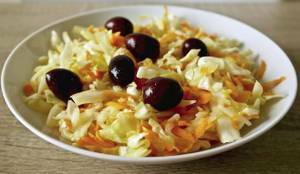 Place cabbage and carrots in a large bowl, pour the dressing and add the salt. Toss the salad (it will reduce in volume). Add the olives on top. High in fibre, low in net carbs. There are 114 calories in 1 serving of Greek Winter Salad (Lahanosalata). Calorie Breakdown: 61% fat, 33% carbs, 6% prot.